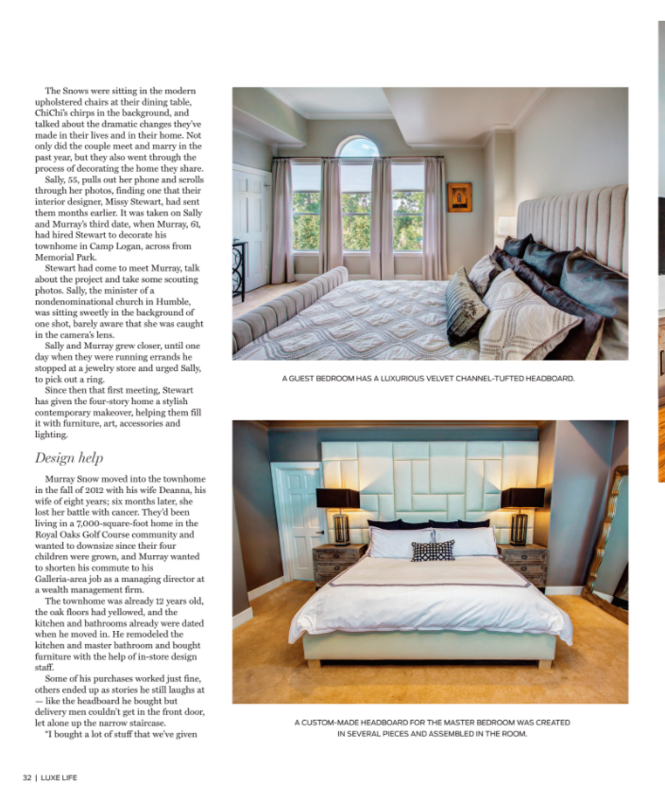 Published in Houston Chronicle’s Luxe Life Magazine. See the full spread at the end of this post. ChiChi hopped on her perch inside the bird cage on the counter in the Camp Logan town home of Sally and Murray Snow. Sally whistled a little Mozart, and the little staling with blue-black iridescent feathers chirped right back. The Snows were sitting in the modern upholstered chairs at their dining table, ChiChi’s chirps in the background, and talked about the dramatic changes they’ve made in their lives and in their home. Not only did the couple meet and marry in the past year, but they also went through the process of decorating the home they share. Sally, 55, pulls out her phone and scrolls through her photos, finding one that their interior designer, Missy Stewart, had sent them months earlier. It was taken on Sally and Murray’s third date, when Murray, 61, had hired Stewart to decorate his town home in Camp Logan, across from Memorial Park. Stewart had come to meet Murray, talk about the project and take some scouting photos. Sally, the minister of a nondenominational church in Humble, was sitting sweetly in the background of one shot, barely aware that she was caught in the camera’s lens. Sally and Murray grew closer, until one day when they were running errands he stopped at a jewelry store and urged Sally, to pick out a ring. Since then that first meeting, Stewart has given the four-story home a stylish contemporary makeover, helping them fill it with furniture, art, accessories, and lighting. Murray Snow moved into the town home in the fall of 2012 with his wife Deanna, his wife of eight years; six moths later, she lost her battle with cancer. They’d been living in a 7,000-square-foot home in the Royal Oaks Golf Course community and wanted to downsize since their four children were grown, and Murray wanted to shorten his commute to his Galleria-area job as a managing director at a wealth management firm. The town home was already 12 years old, the oak floors had yellowed, and the kitchen and bathrooms already were dated when he moved in. He remodeled the kitchen and master bathroom and bought furniture with the help of in-store design staff. Some of his purchases worked just fine, others ended up as stories he still laughs at – like the headboard he bought but the delivery men couldn’t get in the front door, let alone up the narrow staircase. “I bought a lot of stuff that we’ve given away. When you try to do it yourself and it just doesn’t work it’s like trying to operate on yourself,” he said. After his wife died, Murray struggled, bored and lonely. He already had a waterfront home in Rhode Island – his home state, where he liked to visit in the summer – and bought another in Florida so he could fly there on the weekends to play golf with friends. He was ready to look for professional help on his home, and he turned to the internet to find an interior designer. He interviewed three interior designers, settling on Missy Stewart Designs. Around the same time, he met Sally, connecting immediately over dinner. Basically, he loved every finished project on Stewart’s website and wanted her to do the same for him, even if he didn’t exactly know how to say it. A white sectional sofa that Murray had purchased was the starting point for his large living room; Stewart liked it and saw no need to replace it. 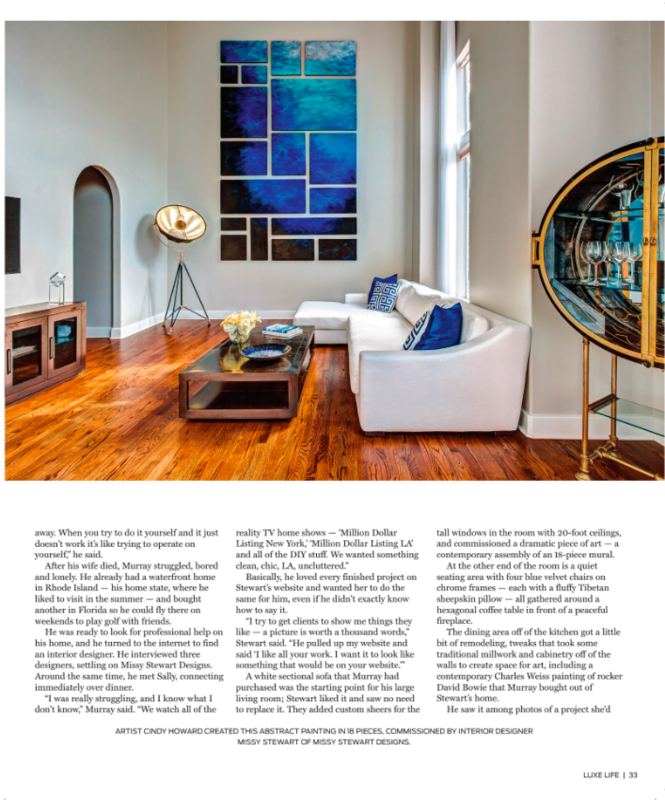 They added custom sheers for the tall windows in the room with 20-foot ceilings, and commissioned a dramatic piece of art – a contemporary assembly of an 18-piece mural. At the end of the room is a quiet seating area with four blue velvet chairs on chrome frames – each with fluffy Tibetan sheepskin pillow – all gathered around a hexagonal coffee table in front of a peaceful fireplace. The dining area off of the kitchen got a little bit of remodeling, tweaks that took some traditional mill work and cabinetry off of the walls to create space for art, including a contemporary Charles Wiess painting of a rocker David Bowie that Murray bought out of Stewart’s home. She added paintings by Julie Keeton Reed, too, and often turns to Houston artists whose work is found in local galleries or in arts communities like the collection of studios at Sawyer Yards, she said. On the first floor, what could be used as a bedroom has been converted into an office, with a chic desk and chair, and a painting of a bull – a symbol of prosperity for those who work on Wall Street – on one wall. Overhead is a long thin hanging light future, so slim you can barely see that it’s there. Lighting is the jewelry of any room, window treatments transform a room, and then art finishes it, she said. “I don’t think a room is done without art. Anyone can buy a sofa, but it’s not decorated until it’s done from the waist up,” Stewart said. Murray gave Stewart a lot of latitude, trusting her judgment and her taste completely. But he did have one requirement: the lighting had to come from the Houston-based Visual Comfort Company, founded by Murray’s good friend Andy Singer. 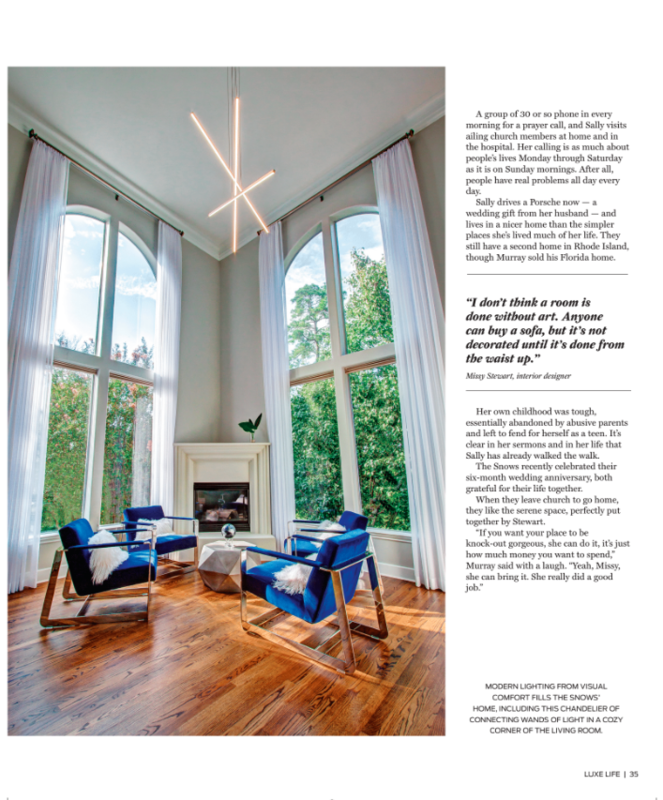 A spiky starburst chandelier hangs over the dining table, and another modern fixture – a combination of three crossing bars of light hangs in the living room near the fireplace. Upstairs, Stewart added unique touches to their master bedroom, with a combination of sheers and blackout draperies, navy blue and white bedding, all showing off a spectacular leather upholstered headboard, so tall it had to be created in pieces, then brought into the room and assembled. A pair of blue velvet barrel chairs finish the space. It’s Sunday morning and the group of singers on stage on Xceleration Church in an aging strip mall in Humble are belting out songs as the 50 or so in the audience of the startup congregation clap, rock and raise their hands in surrender to Christ. Churchgoers wear everything from jeans to their Sunday best, and T-shirts tout “Team Jesus” as well as another favorite team, the Houston Rockets. They’re young and old, black, white and Hispanic, and they mingle like one big happy family. Sally – they call her Pastor Sally here – takes the stage in her chic black pants and top with a gray blazer. High-heeled boots add several inches to her petite stature. She moved to Houston in 1985 and for years she operated the Sally Baker Photography studio born-again Christian felt the call to ministry. She worked as a youth pastor at a nondenominational church, until three years ago when she opened Xceleration, now operated under the umbrella of Bishop I.V. Hilliard and the Association of Independent Ministries. Before they moved into this strip mall location she preached from an empty movie theater to devoted friends who’d’ follow her wherever she’d led them. She only recently got a sign on the outside of her building on FM 1960 West and spent weeks cleaning up the interior, laying carpet, painting walls and spiffing up the restrooms. On Sundays at 10:30 am, a few women work behind a snack bar counter offering free coffee and tacos, while the churchgoers mingle, checking up on each other since their last visit. Sally’s adopted son, Kinta Roberts – who she took in when he was a teenager with nothing and nowhere to go – greets people at the front door. A group of 30 or so phone in every morning for a prayer call, and Sally visits ailing church members at home and in the hospital. Her calling is as much about people’s lives Monday through Saturday as it is on Sunday mornings. After all, people have real problems all day every day. Sally drives a Porsche now – a wedding gift from her husband – and lives in a nicer home than the simpler places she’s lived much of her life. They still have a second home in Rhode Island though Murray sold his Florida home. Her own childhood was tough, essentially abandoned by abusive parents and left to fend for herself as a teen. It’s clear in her sermons and in her life that Sally has already walked the walk. The Snows recently celebrated their six-month wedding anniversary, both grateful for their life together.